Dice one fresh jalapeño finely. You can remove the seeds or leave them in for extra heat. Mix diced jalapeño with cream cheese. Divide ground beef into 1/3 pound patties. Working with one patty at a time, flatten the patty and make a thumb-sized indent in the center. Put a heaping tablespoon of the cream cheese/jalapeño mixture in the indent. Carefully fold the ground beef around the filling to make a ball. Then flatten the ball carefully to make a large patty. If a tiny amount of the filling leaks out or is showing, that's okay. Repeat with the other burgers and then season each burger well with salt and pepper. Roast three whole jalapeños (one per burger) at 350°F for about 10 minutes until the skin is very blistered. Add jalapeños to a bowl and cover. Let sit for 5-10 minutes. Peel roasted jalapeños and use a knife to slice open and remove seeds. Cook burgers in a cast iron skillet over high heat for 5 minutes per side. Then transfer to a 350°F oven to finish in the oven for five minutes. This will leave you with a medium burger. Adjust cooking time according to your tastes if you want it cooked more. Top each burger with a whole roasted jalapeño and a bit of grated cheese. Return to the oven to let the cheese melt. Serve burger on a toasted bun with any condiments you would like. The stuffed hamburger can be a tricky thing. If you overstuff the burger, you’ll have a sloppy mess on your hands. Also, because of the stuffing, you run the risk of under-cooking the burger. In general, it ups the stakes on the standard burger. Luckily, it also ups the flavor. My jalapeno popper burger is all about boosting flavor! Not only is each 1/3 pound burger filled with a spicy cream cheese mixture but each burger is also topped with a whole roasted jalapeno! Don’t worry though. There’s plenty of cheese to counteract that heat. In my opinion, it’s one of the best burgers around. To make the filling for these burgers, I like to mince up an entire whole jalapeno with the seeds. This makes it pretty spicy, but I would hate to give someone a jalapeno popper burger that wasn’t spicy enough! I leave the seeds in for my version, but you could remove them if you wanted to cut down on the heat a bit. Then just mix the minced jalapeno with the cream cheese and your filling is done! A big mistake that people make when trying to stuff a burger is not using one that’s big enough! While I generally like to make ¼ pound burgers, when I’m stuffing them I up that to a 1/3 pound per burger. This gives you more meat to shape around your filling. Once you have your burgers measured, make a large indent in each one with your thumb and add in a heaping tablespoon of filling. Then use your hands to gently form the burger around the filling, making a ball. Ideally, the filling will be right in the middle. Then you can carefully flatten the patty and the filling will be pretty evenly divided throughout the patty. It’s okay if some of your filling is poking out but try to cover it all up if possible. Once you have your patties formed, season them really well with salt and pepper. 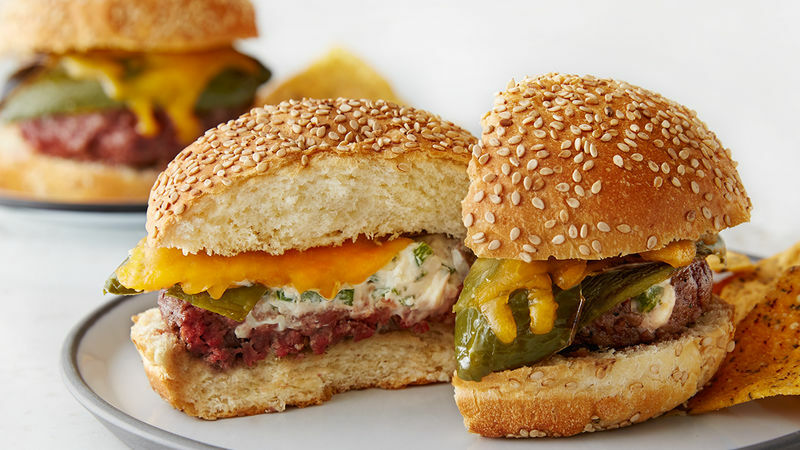 The main topping for these burgers is a whole jalapeno for each burger. Just set some whole jalapenos on a baking sheet and roast them at 350 degrees for 10-15 minutes until they are nicely charred on all the sides. Then stick the jalapenos in a bowl and cover it. Let them sit for a few minutes to steam, which will make them easier to peel. Peel each jalapeno and use a knife to slice off the stem, slice open each pepper, and scrape out the seeds. This is rare for me, but I actually don’t recommend cooking these burgers on the grill. The problem with grill cooking is that if your filling does start leaking, it’ll create a huge mess on the grill. Instead, I recommend cooking them in a large cast iron skillet over high heat. Cook them for about 4-5 minutes per side. Because the burgers are so thick, they probably still won’t be cooked all the way through at this point so stick them in a 350-degree oven for about 5-6 minutes to finish cooking. At some point you can also top the patties with a whole jalapeno and a sprinkle of cheese. Then put the burgers back in the oven for an extra blast of heat to melt the cheese on top. You could serve these with any of the standard burger fixings but I like mine just like it is. Between the cheese in the filling and the spicy pepper on top, it’s plenty flavorful. I chopped mine in half so you could see the delicious filling! You might think that these would be too spicy, but once you factor in the beef and the bun, they have just the right amount of heat. These are definitely a step up from your standard burger, but it’s a step worth taking! Nick was worried that these would be too spicy but they were absolutely perfect. Be sure to check out his blog, Macheesmo, his book, Cornerstone Cooking, and check out his Tablespoon profile.